There are still challenges and concerns present, and as such, we remain cautious but not as much as previously. On a personal note, we returned from a week of 84 and sunny to a week of 7 and gray...(sigh), but back in the saddle-time to get back to work! Till we speak again, stay warm! Put the rack in the middle of the oven and preheat to 375°F. Trim off any leafy tops (these are great for pets, like birds, rabbits, and turtles) and wash the beets. Drizzle beets with olive oil, season with salt and pepper, and wrap completely in aluminum foil. Roast for up to 1½ hours - until fork tender. Remove from the oven and let cool. Peel the beets (the skins come off easily), and then, drizzle with more olive oil, season with salt and pepper (to taste), and serve. When you work for yourself, there are a few tax considerations to keep in mind. Generally, you're required to file and pay estimated taxes on a quarterly basis. Make quarterly payments if you've determined you need to make quarterly payments using Form 1040-ES. Filing annually: If you're filing annually, you'll need to use Schedule C to report income or loss. To file your Social Security and Medicare taxes, you should file Schedule SE Form 1040. Deductions: If you're using part of your home for business, then you may be able to make certain deductions, such as for your office or a portion of your home's square footage used for business purposes. Check out https://www.irs.gov/businesses for more information. Most golfers know that the "Vs" created by the index finger and the thumb of the left and right hands should be in alignment with the right shoulder. You would be surprised at how many golfers have trouble maintaining what was once considered a traditional hand position. For those who struggle with slices, the first adjustment to make is strengthening your grip - especially when your left hand is too far under the shaft. Once you've addressed your grip, always check if your left hand is turned to the right. Once you take up your stance, three knuckles on your left hand should be visible. Conversely, a golfer who hooks should check that the left hand is not in a "strong" position where it is turned too much to the right. Today's culture can seem overwhelming, and we can feel bombarded with information and stress. One way to find some inner peace is through meditation. It's a lot easier than you may think. If you practice, it's about the progress - not the perfection. In fact, the best barometer of success is just checking in to see how you feel after you meditate. Here are a few tips to get started: Prepare: Sit or lie down where you're comfortable. You can sit cross-legged with a straight spine (try sitting on a pillow or folded blanket to straighten your spine) or lie down in a place with few distractions. Set a timer: ten minutes is a good starting point. Focus: Close your eyes, focus on your breathing, and bring your attention to your "third-eye" area, at the middle brow. If your mind wanders, try to gently bring your attention back to your breathing. Finish: Notice how you feel when you're finished. Your primary objective is to simply clear your mind and experience what that clarity feels like. Investing involves risk including the potential loss of principal. No investment strategy can guarantee a profit or protect against loss in periods of declining values. Diversification does not guarantee profit nor is it guaranteed to protect assets. International investing involves special risks such as currency fluctuation and political instability and may not be suitable for all investors. The Standard & Poor's 500 (S&P 500) is an unmanaged group of securities considered to be representative of the stock market in general. The Dow Jones Industrial Average is a price-weighted average of 30 significant stocks traded on the New York Stock Exchange and the NASDAQ. The DJIA was invented by Charles Dow back in 1896. The Nasdaq Composite is an index of the common stocks and similar securities listed on the NASDAQ stock market and is considered a broad indicator of the performance of stocks of technology companies and growth companies. The MSCI EAFE Index was created by Morgan Stanley Capital International (MSCI) that serves as a benchmark of the performance in major international equity markets as represented by 21 major MSCI indices from Europe, Australia, and Southeast Asia. The 10-year Treasury Note represents debt owed by the United States Treasury to the public. 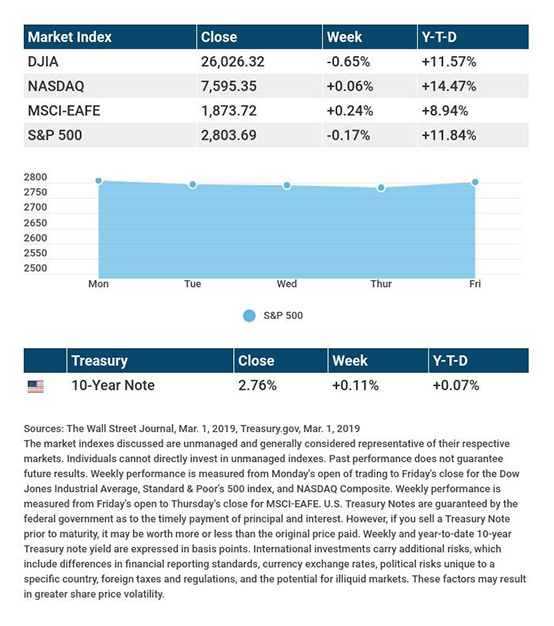 Since the U.S. Government is seen as a risk-free borrower, investors use the 10-year Treasury Note as a benchmark for the long-term bond market. Opinions expressed are subject to change without notice and are not intended as investment advice or to predict future performance. Past performance does not guarantee future results. You cannot invest directly in an index. Consult your financial professional before making any investment decision. Fixed income investments are subject to various risks including changes in interest rates, credit quality, inflation risk, market valuations, prepayments, corporate events, tax ramifications and other factors. These are the views of Platinum Advisor Strategies, LLC, and not necessarily those of the named representative, Broker dealer or Investment Advisor, and should not be construed as investment advice. Neither the named representative nor the named Broker dealer or Investment Advisor gives tax or legal advice. All information is believed to be from reliable sources; however, we make no representation as to its completeness or accuracy. Please consult your financial advisor for further information. By clicking on these links, you will leave our server, as the links are located on another server. We have not independently verified the information available through this link. The link is provided to you as a matter of interest. Please click on the links below to leave and proceed to the selected site.